Gary Kubiak went from Broncos front office exec to impending Denver OC to Vikings assistant head coach. We heard the Super Bowl-winning head coach wanted to bring back former Broncos assistants Rick Dennison and Brian Pariani to be part of the next Broncos offensive staff, and that led to the breakup between the coach and the team with which he is most associated. But John Elway‘s HC interview with Mike Munchak, while not being enough to deter the GM from offering the position to Vic Fangio, went well enough he wanted the Pittsburgh offensive line coach to come to Denver as an assistant. That was a deal-breaker for Kubiak, who sought Dennison to oversee his offensive line concepts, Mike Klis of 9News notes. The Broncos fired Pariani in 2017, and the franchise was not ready to rehire him, Klis adds. Pariani will now coach tight ends in Minnesota. Rich Scangarello is now the Broncos’ OC. On the subject of Scangarello, it looks like the former 49ers quarterbacks coach will be hiring someone to serve in that role in Denver. Previous QBs coach Mike Sullivan, as could be expected following the dismissal of 2017-18 Broncos OC Bill Musgrave, is not expected to be part of the 2019 staff, according to Klis (on Twitter). Sullivan had two NFL tours as an offensive coordinator, with the Buccaneers from 2012-13 and with the Giants from 2016-17. However, the Broncos will retain one of their other offensive assistants. Running backs coach Curtis Modkins will be back, Nicki Jhabvala of The Athletic tweets. The 2016 San Francisco OC who then worked with Fangio in Chicago as the Bears’ 2017 running backs coach, Modkins succeeded longtime Denver RBs coach Eric Studesville and oversaw the stunning development of Phillip Lindsay. He will have a chance to continue working with the Pro Bowl back and third-round pick Royce Freeman in 2019. Perhaps the Broncos’ best center since Tom Nalen, Matt Paradis is not a lock to return to Denver as a free agent. The Broncos would like him to come back, but Klis notes he will test the market. This could be a significant development, as the 29-year-old blocker will probably be the top center available come March. Denver brass and Paradis entered into extension discussions last year, but the sides could not reach an agreement. Paradis’ ironman streak ended in November as well, with a broken fibula ending his season. The Broncos stand to hold $40MM-plus in cap space and have some cap-casualty candidates, but Paradis going to the market may well mean it will cost a team eight figures annually to sign him. His new team dealing perhaps the final blow to his previous employer’s 2018 playoff hopes via 19-17 win in Week 9, Texans wide receiver Demaryius Thomas expressed issues he had with the Broncos’ coaching staff. Thomas said during an interview with former Broncos Ray Crockett and Rod Smith on Orange and Blue 760 (via The Athletic’s Nicki Jhabvala, on Twitter) Vance Joseph informed him he would be staying in Denver after the trade deadline. Though, to be fair to the second-year head coach, he may not have known the status of John Elway‘s progress in acquiring a mid-round pick for the veteran wideout. Thomas said his agent told him Elway wanted a fifth-round pick in a trade, helping perhaps to explain the GM’s decision to accept a Texans fourth-round pick. Additionally, Thomas told Crockett and Smith the coaching staff made him feel as though he was holding back rookies Courtland Sutton and DaeSean Hamilton and that first-year receivers coach Zach Azzani asked only Thomas to come out of a Jets loss to give Hamilton more snaps (Twitter links via Jhabvala). Joseph said (via Mike Klis of 9News) he didn’t recall a trade-related conversation with Thomas unfolding the way the since-jettisoned wideout said it did. 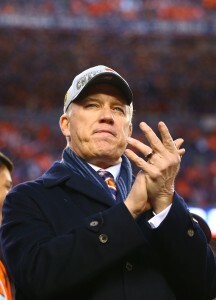 As for Joseph’s job security, Elway offered a lukewarm endorsement. “At this point in time, we’re going to stay the course,” Elway said during an Orange and Blue 760 interview (via Arnie Stapleton of the Associated Press). “I think there’s enough good things that are going on as far as us and the way that we’re playing. I’m much more encouraged this year than I was last year.” The Broncos have lost four one-score games — all to teams with at least six wins — but are 3-6 and may be on the verge of their first back-to-back losing seasons since the mid-1970s. It’s hard to imagine Joseph (8-17 as a head coach) receiving a third year. A possible route Elway might go in 2019, look no further than the success the Chiefs are having. 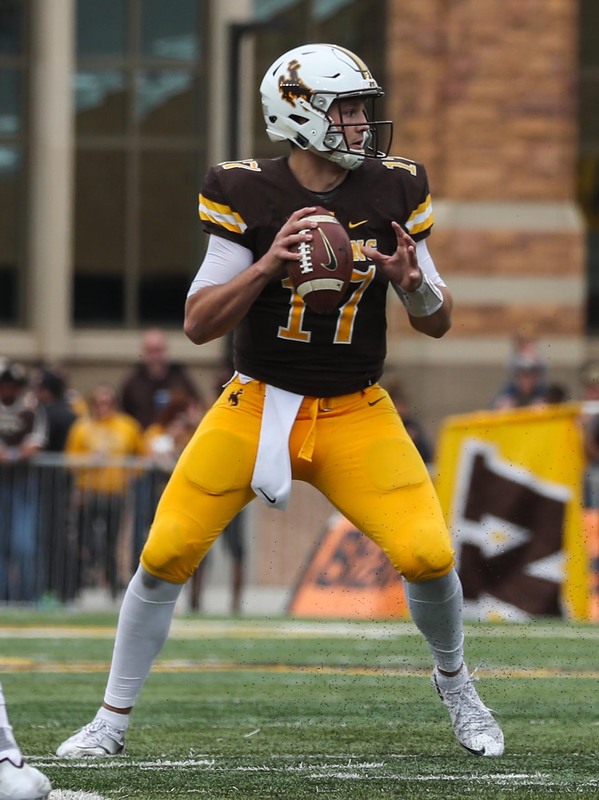 Buzz is developing in NFL circles (via SI.com’s Albert Breer) that Elway has taken a “special interest” in the college-type concepts that have helped not just the Chiefs but other teams around the league. Should Elway hire another coach in January, it will be his fourth since taking a front office job with his former team. He interviewed Joseph, Kyle Shanahan and Chiefs ST coordinator Dave Toub for the job Joseph received. Wide receiver Jordan Taylor won’t play for the Broncos this season, Jhabvala tweets. He will stay on the PUP list the rest of the way. Taylor’s 21-day practice window expired on Monday. Matt Paradis underwent surgery to repair a broken right fibula, Klis notes. The veteran center will be a free agent in March, but Klis adds the Broncos are interested in bringing him back. The sides discussed an extension before the season but did not come to terms. Prior to the injury Sunday, Paradis had started every game for the Broncos since the start of their 2015 Super Bowl season. The ownership of the Broncos has been a hotly contested issue for years now, and it appears the fighting between various members of the Bowlen family might finally be reaching a boiling point. Owner Pat Bowlen has been unable to manage the team for a while now as he suffers from Alzheimer’s, and now Pat’s younger brother Bill Bowlen is suing the trust in charge of the team, according to Ryan O’Halloran of the Denver Post. The team had been placed into the trust, led by Broncos CEO Joe Ellis, which has been taking a very slow years-long approach to crowning a new controlling owner, in July of 2014. The battle within the family had been playing out mostly behind the scenes until recently, when it spilled out into the press. Just last week Bowlen’s 28-year-old daughter, Brittany Bowlen, confirmed her long-rumored desire to eventually take over the team. Some league executives and members of the Broncos organization are reportedly most bullish on her prospects as a future owner. A different one of Bowlen’s daughters Beth Bowlen Wallace, 47, came out a few months ago and criticized Ellis for dragging his feet and said she wanted control of the team. Ellis responded by saying “we have determined that she is not capable or qualified at this time” in regard to Beth. Now Bill is suing the trust, asking the court to remove Ellis and the other members of the trust “due to their failure to uphold Pat Bowlen’s wishes and act in the best interest of Pat Bowlen, his family and the Broncos”, according to O’Halloran. Troy Renck of Denver 7 tweets “Bill Bowlen has not had stake in Broncos for years” after selling his shares to Pat back in 2002 and writes that he doesn’t “see how he would have any enforceable right in this matter.” Renck also tweeted out the official response from the trust, which states that Bill is working with the same lawyers as Beth Bowlen Wallace. It appears as if Beth and Bill are working together to try and acquire control of the team before it is handed over to Brittany, who seems to be the most likely and preferred successor at this point. It’s a messy situation, and one that has had a ripple effect in the front office. It’s thrown the team into limbo, and has contributed greatly to the job security of GM John Elway, as no one really has the authority to fire him currently. We should know more about the lawsuit soon, and it will be a very interesting story to watch play out. John Elway could be a potential candidate to buy the Broncos should the Bowlen family decide to sell the team, speculates Mark Kiszla of the Denver Post. There’s been some drama recently within the Bowlen family about who should take over the team. Owner Pat Bowlen removed himself from the team several years ago as his health worsened. The team was placed into a trust, and Bowlen’s children have been doing battle in the media for a while now as several angle to be put in charge. Broncos CEO Joe Ellis recently said Pat’s daughter Beth wasn’t “qualified” for the position, a claim she responded to forcefully. Kiszla points out that Elway’s contract as head of football operations runs until 2021. He thinks that if everything goes smoothly until then, Brittany Bowlen could step in then and run the team. But if things go south, the family could force a sale of the team, in which case Kiszla thinks Elway might try and put together the funding to buy the team himself. Broncos rookie undrafted pass-rusher Jeff Holland not only has a good chance at making the team, but at becoming the “next solid undrafted pass rusher”, according to Ryan O’Halloran of the Denver Post. O’Halloran thinks Holland “made an impression” this offseason and notes that Shane Ray’s injury will improve Holland’s chances of making the team. In case you missed it, Patriots tight end Dwayne Allen could be cut by the team in a cost-saving move. Mock drafts have gone in numerous directions regarding the Broncos‘ No. 5 overall pick, and it’s possible the team could make yet another big investment at the position. But if they do, Case Keenum will not be ceding the reins anytime soon. 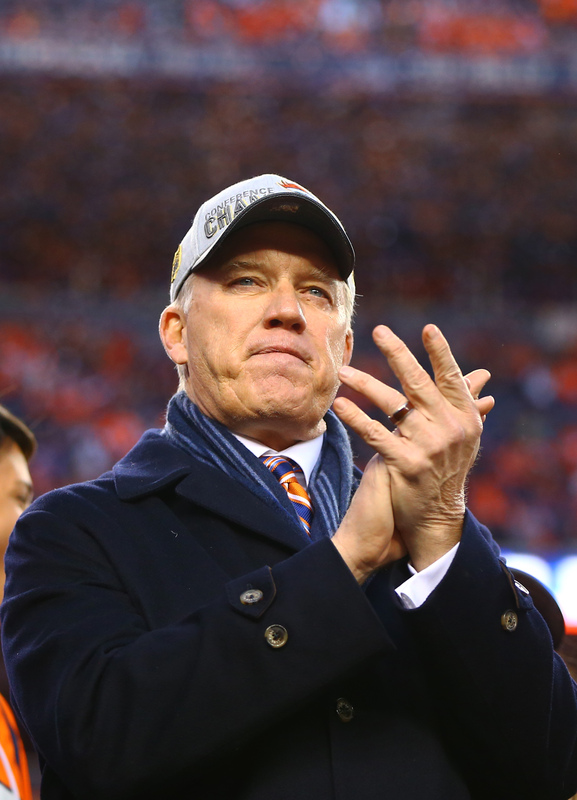 John Elway confirmed that if the Broncos do select a quarterback at No. 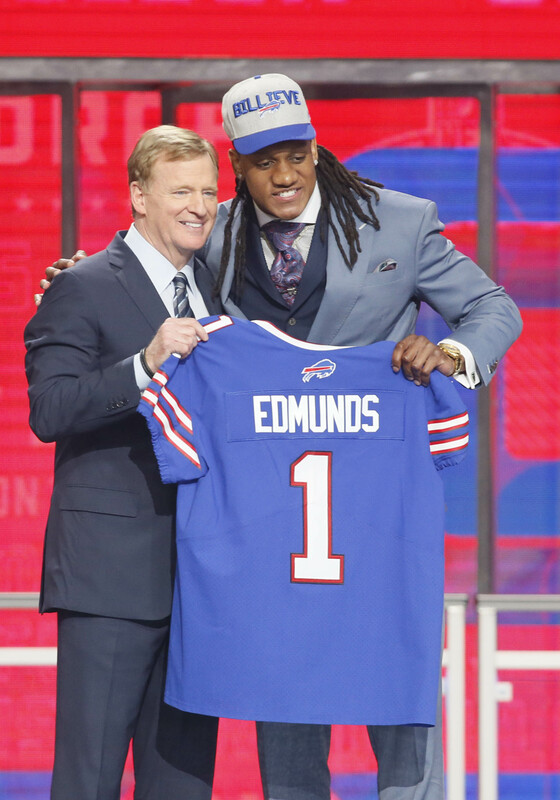 5 overall the recently signed quarterback would be the unquestioned first-stringer. The 2016 Eagles thrust Carson Wentz into duty from the start because they traded Sam Bradford, whereas the 2017 Bears allowed Mike Glennon four starts before turning to Mitch Trubisky. It can be expected Keenum will have a longer leash, if the Broncos opt to bypass a top-tier non-QB. The Broncos have gotten All-Pro work from Chris Harris for No. 2 cornerback money over the past three seasons. They’ve agreed to incentivize the eighth-year corner’s deal, and Klis details what that will entail. Harris was a first-team All-Pro in 2016 and a second-teamer in Denver’s Super Bowl season; should he land on one of those two teams this year, he’ll earn $500K. Harris can collect $200K for a two-interception season, and if he reaches five picks, Klis reports that bumps up to $500K. Harris has intercepted two passes in each of the past three seasons. Interestingly, the Broncos’ win total will impact their top corner as well. Klis reports Harris playing 65 percent of Denver’s snaps and the team winning six games will mean a $300K bonus, with a 75 percent snap season and eight Bronco wins meaning that spikes to $600K. Harris, who has an $8.5MM base salary in 2018, has been a full-time player for the past six seasons. If Denver returns to the playoffs, the soon-to-be 29-year-old DB earns $300K. Prior to their trade earlier tonight, the Broncos and Giants had been circling each other about a deal for Riley Dixon for a bit now, per Jordan Raanan of ESPN.com (on Twitter). Klis reports (via Twitter) Vance Joseph told the incumbent punter the day the team signed Marquette King he would be moved. Multiple teams were interested in the third-year specialist, per Klis. However, the GM that traded Tim Tebow after a memorable season doesn’t regard it as a must to have a mobile quarterback. “The bottom line is that I believe the one thing is that you got to be able to win from the pocket,” the eighth-year exec said. “You can win games, but you can’t win championships unless you have the ability to win it from the pocket. Then if you can get out and move around and create, and do those types of things then that’s an added bonus.” While the Broncos have been connected to Baker Mayfield, an earlier report indicated they were high on Josh Rosen — the least mobile of the top four QBs in this class. Among the most divisive issues facing the NFL today are national anthem protests. That division is also felt among the owners themselves, who are currently in Orlando for the annual owner’s meetings. Jets CEO Christopher Johnson, however, falls on the other side of the argument, according to ESPN’s Kevin Seifert (Twitter link). Despite McNair’s seeming assuredness, the owners do not appear to be near to a solution. The issue is sure to permeate throughout the meetings. Sticking with the Jets, wide receiver Robby Anderson had his court date moved from Monday to Aug. 6, according to ESPN’s Rich Cimini. The new date will now take place while the Jets are at training camp. The charges, stemming from a January incident, include three felonies: second-degree felony harm to a public servant or family, third-degree felony fleeing/eluding police while lights/siren active and third-degree felony speeding. After being arrested, Anderson threatened to sexually assault the wife of the arresting officer, according to reports. Anderson was allegedly clocked at 105 mph in 45-mph zone speeding away from police while running multiple red lights. The Broncos will not make a change following a disappointing 5-11 campaign, as the team will bring back head coach Vance Joseph for 2018, CBS Sports’ Jason La Canfora reports (Twitter link). Team executive vice president of football operations and general manager John Elway reportedly went back and forth on the decision and decided to keep the first-year coach after taking the night to think it over. It was long expected that Joseph would be retained but rumors picked up on Sunday that he would likely be out instead. Elway apparently had a change of heart once again and opted keep the defensive-minded coach. Had he been let go, he would have been the first non-interim coach in team history to be fired after just one season. The first order of business for Joseph in his second season will be to find consistency at the quarterback position. The team will enter 2018 with Paxton Lynch and Trevor Siemian on the roster, but it is likely the team will look to free agents like Kirk Cousins or the NFL Draft to fill the role. With the No. 5 pick in the upcoming draft, the team is in borderline contention for UCLA’s Josh Rosen and USC’s Sam Darnold, the two highest-rated signal-callers at the moment. With a strong defense and plenty of weapons on offense, the Broncos are a top candidate to make a rapid turnaround in 2018. The Raiders‘ firing of Jack Del Rio less than a year after signing him to an extension would have come as a shock at this season’s outset, when the team was picked by most to win the AFC West. But now that Jon Gruden‘s name is in the mix, the franchise is operating like it has a real shot to lure him back to Oakland. In firing Del Rio, the Raiders are confident they can bring Gruden back to Oakland, Ian Rapoport of NFL.com tweets. The Raiders doing this looks indeed to be for a Gruden landing, with Vincent Bonsignore of the Los Angeles Daily News hearing (Twitter link) the Gruden buzz is legitimate. This comes shortly after Gruden’s name was connected with the Buccaneers. But the Bucs kept Dirk Koetter after a less successful tenure compared to Del Rio’s Oakland run. The Gruden noise appears louder regarding the Raiders. He was the most recent coach to receive a four-year opportunity coaching the Silver and Black, doing so from 1998-2001 prior to being traded to the Bucs in early 2002. Here’s the latest from the coaching carousel. Marvin Lewis‘ Bengals played a spoiler in Week 17, knocking the Ravens out of the playoffs. The coach’s future in Cincinnati remains murky, however, as his contract expires. Lewis made an interesting comment postgame regarding his status. When asked if he would accept Mike Brown‘s offer to remain the Bengals’ HC in 2018, Lewis replied (via Katherine Terrell of ESPN.com), “It’s a little more complicated than that.” A report emerged last week about Lewis stepping down from his 15-year post. He has yet to confirm that. Vance Joseph‘s Broncos tenure is also up in the air. However, the rookie head coach said he “absolutely” expects to be the team’s coach in 2018 and said (via Nicki Jhabvala of the Denver Post, on Twitter) he has not been informed of a decision yet. Joseph said he will meet with John Elway tonight or Monday. The Broncos have never fired a coach after one season. However, this is only the second time in 27 seasons they’ve won five or fewer games. Mike Klis of 9News reports (on Twitter) Elway will not make the decision tonight, planning to sleep on it. Klis adds that it shouldn’t be a surprise if Joseph is given a second season. Bruce Arians met with Cardinals owner Michael Bidwill on Sunday morning, Laura Okmin of Fox Sports reports, adding a decision on whether or not he will step down could come by New Year’s Day (Twitter link). Arians has said himself his decision could come as soon as Monday, or as late as February, although Adam Schefter of ESPN.com notes he’s likely to leave. After jumping out to a 5-0 start this year, the Chiefs have lost four of their last five games, making themselves vulnerable to the surging Chargers and even the Raiders in the AFC West. The team’s offensive struggles have contributed to that swoon, and quarterback Alex Smith has fallen off a bit after a torrid first half. He is coming off a miserable performance in Kansas City’s loss to the lowly Giants last week, but Jason La Canfora of CBS Sports writes that the Chiefs would only turn to rookie first-rounder Patrick Mahomes if Smith were to get hurt. Smith will remain under center the rest of the year, though Kansas City still plans to shop him in the offseason as it prepares to usher in the Mahomes era. New Chiefs CB Darrelle Revis will likely make his Kansas City debut next week, as Ian Rapoport of NFL.com tweets. Paxton Lynch is back under center for the Broncos, and Rapoport (video link) says they want him to start the rest of the year so they can fairly evaluate what they have in last year’s first-rounder. The team will run a much simpler offensive scheme for Lynch than what it employed under former OC Mike McCoy, and Lynch has been encouraged to simply do what he does best, which is run around and improvise. We learned earlier today that the Raiders are likely to fire OC Todd Downing at season’s end, and that McCoy is an obvious candidate to replace him. Within that story, we cited another La Canfora article in which the CBS scribe reported that the McCoy firing might have been just the tip of the iceberg for the Broncos. 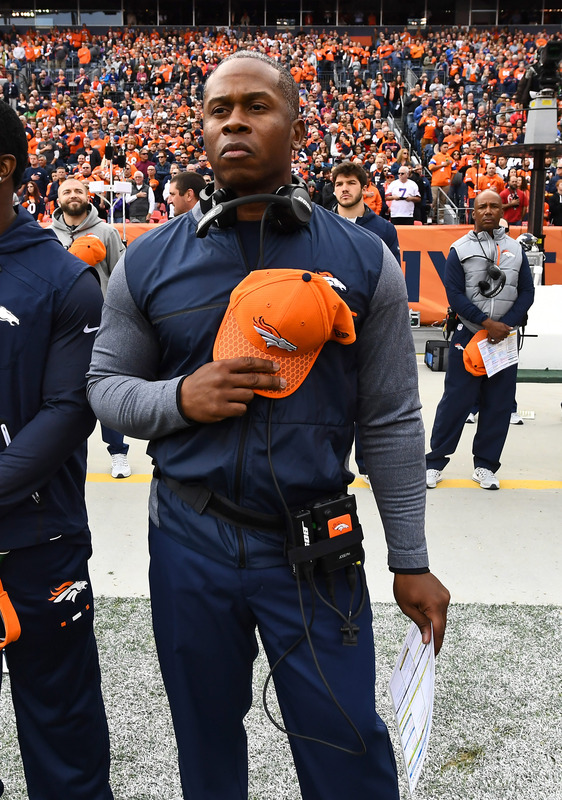 He suggests that there is speculation that head coach Vance Joseph could be out after just one year on the job, and at the very least, that Denver could shake up other parts of its coaching staff. Broncos GM John Elway has taken a lot of heat for his club’s 3-7 record in 2017, but Mike Klis of 9News.com says that criticism is largely unwarranted. In an interesting piece that pits Elway’s draft results against those of his long-tenured colleagues, Elway comes out near the top of the heap of NFL general managers, which makes Klis believe he will be able to turn the ship around in 2018. We learned Friday that Chargers rookie wideout Mike Williams avoided an ACL tear during his team’s Thanksgiving Day win over the Cowboys, and Rapoport tweets that Williams has been diagnosed with a bone bruise. While Williams is expected to miss next week’s contest against the Browns, he will be week-to-week thereafter, which is a big deal for a team that has forced its way back into the playoff hunt.